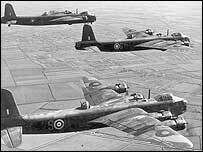 A search by the RAF for the family of seven airmen, killed in World War II when their Stirling bomber crashed in the Netherlands, has ended in success. One of the crew was Sgt John Robinson, from the Sevenoaks area of Kent. Three sets of human remains were found when the aircraft was excavated at the crash site by the Dutch Army last May. Following an appeal, the RAF said Sgt Robinson's son had been located in Ashford and a military funeral would be held in the Netherlands on 31 August. The airman was the flight engineer on board the Stirling W7624 when it crashed near Bentelo on 28 August 1942, following a raid over Germany. The RAF had been trying to find his next-of-kin, and those of the rest of the crew, so that the remains found could be buried with full military honours. The aircraft was left where it crashed until May 2005. RAF spokeswoman Sue Raftree said the families of all seven airmen, including two from New Zealand, had responded to its appeal and would be attending the funeral in August. She said the three sets of human remains would be buried in the same coffin. It is believed that after the aircraft crashed the bodies of two of the seven crew were recovered, while a third person jumped from the plane but his parachute failed to open.